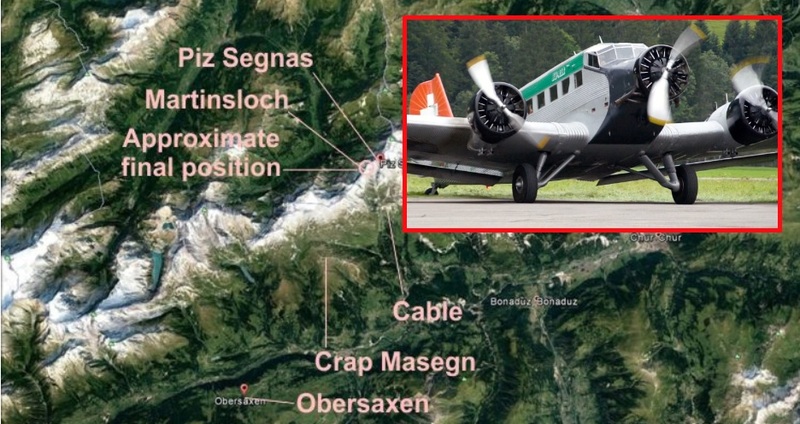 A second plane has crashed in the Swiss Alps Saturday. Few details other than an image of the wreckage have been released. The crash was reported just hours after a family of four was killed when their small aircraft crashed in a forest. A local airline JU-AIR said one of its Ju-52 airplanes had crashed. The Ju-52 aircraft seats 17 passengers along with two pilots, but it was not announced how many were on the plane. The airline reported on its website, "We have the sad duty to announce that one of our Ju-52 aircraft had a accident today." Five rescue helicopters were deployed to the crash site which is side to be on the west side of the Piz Segnas mountain in the canton of Graubueden, according to local police. A local newspaper called Blick reported all passengers aboard the plane had perished. The airline which the most recent crash belonged to is based out of Duebendorf in canton Zurich. JU-AIR offers tourists sightseeing, charter, and adventure flights. The small airline has three midcentury Junkers Ju-52 aircraft, also known in German as "Auntie Ju" planes. The first crash reported Saturday took place in the Rengg mountain pass area in the canton of Nidwalden. The crash killed two parents and their two children; both tragedies are under investigation. so which one knew hillary?